The Wyoming Department of Transportation Reference Marker System lists highways by their state inventory control number. Since these inventory numbers are not featured on the highways, lists compiled here are designed to provide mile posting information for individual, signed highways across the state. The following tables lists all of the major towns, geographical features, highway junctions, and points of interests along the route. The second column shows the actual milepost marker found on the highway; note that the mileposts rarely reset at zero at the start of new highways. The distance column lists the distance between each geographical feature. If there are multiple features that require several lines to explain, then the distance in this column is omitted. The overall mileage column references the cumulative mileage of the route, with the bold-faced number in the column providing the total mileage for a signed route. Acronyms used include “CL” referring to “City” or “Corporate” Limits, AH for miles Ahead, BK for miles Back. Interstate exit lists compiled from the Wyoming Department of Transportation 1997 Wyoming Reference Marker System and personal observation by Andy Field. Milepost 0 Welcome to Wyoming, “A Great Land Outdoors,” “Like No Place on Earth,” and “Forver West” (Don’t forget to “Cowboy Up!”) Speed Limit 75 I-25 enters Wyoming from Colorado along with U.S. 87 a short distnace south of Cheyenne. The U.S. highway is well-signed throughout Wyoming. Exit 2 EAST TO Terry Ranch Road Wyoming 223 is the old alignment of U.S. 87 before it shifted to I-25. Get your free Wyoming State Highway Map at the Rest Area and Welcome Center. Exit 8A, 8C Laramie Omaha Yellowstone-Grand Teton National Parks via or This is the only cloverleaf interchange joining two Interstates within the state of Wyoming. The exits are labeled B-D for I-80 travelers. Exit 9 Lincolnway Drive The guide signs fail to mention Business Loop I-80, similar to the guide signs on I-25 in Denver that fail to mention either Bus. I-70 or U.S. 287 at the Colfax Avenue exit. Exit 10 FORMER Missile Drive Happy Jack Road F.E. Warren Air Force Base Formerly, this interchange connected to WYO 226, while WYO 210 had no direct access. The signs at this interchange omit WYO 226. Exit 12 BUSINESS SOUTH WEST Central Avenue and Cheyenne North This interchange was completely redesigned in 1982. Exit 17 NORTH Torrington Newcastle LEFT EXIT SOUTHBOUND U.S. 85 parts ways with I-25 and U.S. 87 heading northbound. Heading south, I-25 and U.S. 85 are nearly inseparable all the way to Las Cruces, New Mexico (excluding the sections from Castle Rock to Denver and from Denver to Cheyenne). Exit 21 Laramie County Route 220 Ridley Road The stretch of I-25 between exits 17 and 54 is devoid of services and interest. Do not venture forth with less than a half tank of gas! Exit 34 Laramie County Route 120 SOUTH Nimmo Road True Road TO CR-232 True Road is likely to be named for the True Oil Company, which was very prominent in Wyoming. Exit 39 Laramie County Route 123 NORTH Little Bear Community Road TO Hirsig Road and Moffett Road Little Bear Community Road is Historic U.S. 87 between Exits 39 and 47. Milepost 47 Welcome to PLATTE COUNTY! Exit 91 REST AREA Dwyer Junction Most Interstate rest areas in Wyoming are designed to handle traffic in both directions. Usually this means a full diamond interchange will provide direct access to a single rest area from each roadway. Exit 92 EAST Guernsey and Torrington TO NORTH (left exit) U.S. 26 used to end here until 1950; then it was extended west to Oregon. I-25, U.S. 26, and U.S. 87 follow the historic Oregon Trail from Exits 92 to 188B. Exit 94 Platte County Routes 114 and 117 El Rancho Road; Fish Creek Road; Pepper Road Pepper Road is the original routing of U.S. 26. Exit 100 NORTH Cassa WYO 319 is Historic U.S. 87 between Exits 100 and 126. Milepost 119 WELCOME TO CONVERSE COUNTY! Exit 126 Lusk and Chadron, Nebraska U.S. 85 combines with U.S. 20 and U.S. 85 through to Mule Creek Junction, where it turns east into South Dakota. Exit 126 REST AREA Orin Junction This is the western terminus of U.S. 18. The original route of U.S. 20, U.S. 26, U.S. 87 follows Converse County Route 1 (Irvine Road) as an alternate route into Douglas along the railroad. Exit 135 TO NORTH Douglas I-26 begins to turn westward at Douglas en route to Casper. The Laramie Mountains prevent a more direct approach from the south. This routing originated with the Yellowstone Highway in the late 1910s and early 1920s. Exit 140 TO NORTH to Gillette and and SOUTH Douglas Esterbrook Road A rare four-business route overlap. Exit 146 SOUTH La Prele Road TO Cold Springs Road WYO 91 and WYO 96 together make up Historic U.S. 87 between Exits 140 and 146. Milepost 173 Welcome to NATRONA COUNTY! Exit 185 SOUTH Evansville; Wyoming Boulevard; Casper Beltline Casper’s Eastgate Mall lies a short distance south of I-25 via WYO 258. WYO 258 is the Casper Beltline, which provides a through route to Casper Mountain, WYO 220, and Casper College. Exit 186A-B BUSINESS EAST SOUTH East Yellowstone Highway; Casper; North Beverly Street; Bryan Scott Stock Trail Business Loop I-25 in Casper is rather short, only providing access to the city center. It returns to I-25 at Exit 188A. Exit 188A SOUTH Center Street; Downtown Casper Suffixed exit numbers (such as 188A) are rare in Wyoming since most exits are spaced a mile or more apart. Exit 188B WEST Walnut Street to CY Avenue WYO 220 provides the best route for southbound travelers to Laramie (via WYO 487) and to Rawlins (via U.S. 287). Direct access to Wyoming 220 from Interstate 25 and U.S. 20-26 was provided with completion of the Casper West Beltline (Wyoming 257). The Oregon Trail splits off from I-25 here to follow the North Platte River and WYO 220. Exit 189 WEST Shoshoni; Natrona County International Airport; Port of Entry To Yellowstone-Grand Teton National Parks, follow west via Exit 189. Exit 191 SOUTH Barr Nunn; Wardwell Road; Salt Creek Highway WYO 254 is Historic U.S. 87E (1926-1936) and Historic U.S. 87 (after 1936). Exit 210 NORTH Midwest; Edgerton; Horse Ranch Creek Road WYO 259 provides access to the historically notable Teapot Dome. WYO 259 and WYO 358 between Exits 210 and 227 is Historic U.S. 87. U.S. 87 was decommissioned here in the early 1980s, when I-25 was completed. Milepost 234 Welcome to JOHNSON COUNTY! Exit 235 Johnson County Route 210 SOUTH Tisdale Mountain Road, Long Canyon Road, Dead Horse Road Tisdale is actually on the exit sign; the other roads feed into the exit. Exit 246 NORTH Powder River Road WYO 196 / Historic U.S. 87 and I-25 cross the Powder River here. Exit 298 Buffalo This business loop is more like a spur, since it leaves I-25 and never returns. Use Exit 298 to . Exit 299 Buffalo Worland Yellowstone-Grand Teton National Parks and Bighorn National Forestvia use Exit 299.
continues north along to Sheridan and Billings. Utah Exit 197 Wyoming Port of Entry (EASTBOUND ONLY) Travelers heading east along I-80 will start to see Wyoming DOT-issued signs warning motorists about the upcoming Port of Entry four miles before the state line. Milepost 0 Welcome to Wyoming and Uinta County! Exit 1 Wyoming Port of Entry (eastbound only); Old Utah Port of Entry (westbound only) SPEED LIMIT 75 All commercial and some private trucks must stop at the Port of Entry. The Wyoming facility was finished in 1994; it is designed to handle significantly more trucks than it could before the facility is upgraded. In the other direction, the Utah Port of Entry is further west from here. TO NORTH Harrison Drive; Evanston West Right after the Port of Entry, confirming markers for U.S. 189 appear. Although signs in Utah do not show it, U.S. 189 technically shares alignment with U.S. 40 from Heber City to Silver Creek Junction and with I-80 from Silver Creek Junction to east of Evanston. Exit 5 Front Street Mirror Lake Scenic Byway High Uintas Wyoming State Hospital This exit is the most direct route into downtown Evanston. It also provides access to Wal-Mart, McDonalds, and the whole array of franchise facilities … and the state mental health facility is located on the other side of the freeway from the franchises. Although Exit 5 now provides direct access into Evanston, this interchange was not part of the Evanston exits as recently as 1985. That middle exit was opened in spring or summer 1986. On the westbound “Evanston NEXT 3 EXITS” sign, a previous green-out for “3” concealed “2.” Before, access to WYO 89 or WYO 150 was available at either Exit 3 or Exit 6, and driving through Central Evanston via Business Loop I-80. This is one of the reasons why those two exits are also signed as TO , even though they are not the most direct route to the state highway. TO NORTH Harrison Drive; Evanston East STATE OF WYOMING INFORMATION CENTER AND REST AREA – Pick up your free Wyoming state map at the information counter. For eastbound travelers, Old Evanston Road (Uinta County Route 180) is the original route of Historic U.S. 30 between Exits 10 and 30. Exit 10 Painter Road The Old Eagle Rock Ski Area was near this exit. Exit 15 Divide Road Three Sisters The Three Sisters are the three hills I-80 traverses between Exits 15 and 30. Heading westbound, the first sister is just after Exit 15. Uinta County Route 181 connects Historic U.S. 189 with Historic U.S. 30 (Uinta County Route 180). The U.S. 189 exit marks the low point between the first two Sisters from I-80 eastbound. Exit 21 Coal Road Between Exits 18 and 21, westbound travelers climb onto Toms Draw and then descend into the Piedmont Valley. Exit 23B/24 Uinta County Route 141 Uinta County Route 173 Leroy Road Piedmont Road Heading westbound, I-80 ascends to over 6000 feet elevation at Bigelow Bench. Heading eastbound, I-80 leaves the Green River Basin and flattens out somewhat. Exit 30 Uinta County Route 202 Bigelow Road (also Bigelow Bench Road) Westbound travelers may exit here for along Uinta County Route 180 between Exits 30 and 10. Exit 33 Uinta County Route 230 Union Road Traveling eastbound, I-80 enters the Bridger Valley, named for the famed mountaineer, Jim Bridger. Exit 34 Fort Bridger; Urie; Lyman through the Bridger Valley communities of Fort Bridger, Urie, and Lyman is the longest Interstate business loop in Wyoming, running approximately 15 miles between Exits 34 and 48. As of 2005, the eastbound and westbound signs announcing the business loop actually read LOOP, which is unlike any other business loop sign in the state. Most times, Wyoming DOT writes the word “BUSINESS” above the business loop shield. There is no cardinal direction indicator (i.e., East or West). Fort Bridger State Historic Site via . Follow for . For westbound traffic, this is a good place to stop before heading onto Evanston. During inclement weather, it is advised to stop here as well, since the freeway traverses the “Three Sisters” further ahead. Tire chains and snow tires may be necessary in winter. Exit 41 SOUTH Lyman REST AREA – The Lyman Rest Area (Exit 41) is a solar-powered rest area. There is a big display there that explains how the water is heated by the panels on the roof. This is a common design for the smaller rest areas across the state of Wyoming and also some of the larger ones too. Rest area buildings are also designed to face the sun and to avoid the wind with sloping roofs. For that reason, Wyoming rest areas are considered state-of-the-art in energy efficiency. Exit 48 Lyman; Mountain View; Bridger Valley The name “Mountain View” is used for two separate communities in the state of Wyoming. One is just south of this exit on , and the other is a “suburb” of Casper along U.S. 20 / 26 Business. Exit 53 EAST Church Butte Road This exit again connects Interstate 80 to . Between 1991 and 1997, the I-80 reassurance signs in both directions at this interchange included assemblies for U.S. 30. That was wrong, since U.S. 30 left (or will join) the freeway at Exit 66. Milepost 56 Welcome to Sweetwater County! Exit 66 WEST Kemmerer; Pocatello, Idaho; Fossil Butte National Monument This interchange was expanded in 1996 to allow full access. Previously, I-80 eastbound traffic could not take U.S. 30 west, and U.S. 30 eastbound traffic could not take I-80 west. This problem was eventually remedied. Grand Teton National Parks via sign here, but it is an indirect route for westbound travelers, unless they plan to see Fossil Butte National Monument first. U.S. 30 connects to U.S. 189 north in Kemmerer. Exit 68 EAST Little America Billboards advertising “Little America” line I-80 for miles on either side of this outpost. Motorist services include a motel, gas station, truck stop and restaurant all rolled into one. The population of Little America consists of the service center’s employees who do not wish to commute from nearby Green River. Other “Little Amnerica” facilities are in Salt Lake City and Cheyenne. WYO 374 is poorly acknowledged for the few miles of “shared alignment” between Exits 66 and 68. The state highway sees disjointed sections due to I-80. Exit 85 Sweetwater County Route 59 TO Covered Wagon Road Gaensslen Ranch; Rolling Green Golf Course; rest area. WYO 374 between Exit 68 and Green River is part of Historic U.S. 30. TO SOUTH West Flaming Gorge Way Green River Home of the Green River Ordinance. Signs indicating enforcement of this ordinance are posted along Business Loop I-80 as it enters the city. The ordinance states that commercial solicitors must be registered with the city and have to operate under strict limits. This law restricts traveling con men from setting up shop and swindling the unsuspecting locals. TO SOUTH East Flaming Gorge Way Green River Flaming Gorge National Recreation Area via Exits 89 and 91. Expedition Island National Historic Landmark via at either Exit 89 or Exit 91. Historic U.S. 30 between Exits 91 and 99 was supplanted by I-80. The only way between Rock Springs and Green River is via the freeway. Exit 99 SOUTH East Flaming Gorge Road to Vernal, Utah Flaming Gorge National Recreation Area; Dinosaur National Monument via . Exit 102 TO SOUTH Dewar Drive; Rock Springs West Interchange Plenty of motorist services available at this interchange. Foothill Boulevard, which parallels I-80, is Historic U.S. 30 between Exits 99 and 102. At Milepost 101, Foothill Boulevard was realigned to accomodate a planned interchange along I-80 with Foothill Boulevard north and Sunset Drive south. Exit 103 College Drive; Western Wyoming Community College LOCAL ACCESS ONLY. This interchange was completed in 1991. Exit 104 NORTH Elk Street; Farson; Pinedale Yellowstone-Grand Teton National Parks via NORTH. TO SOUTH Pilot Butte Drive; Rock Springs East Interchange A rest area was planned at this interchange. Exit 111 SOUTH Baxter Road to Airport Road Use south to Rock Springs Municipal Airport and south. Exit 130 NORTH to Sweetwater County Route 84 SOUTH Point of Rocks; Black Buttes Road; Jim Bridger Power Plant Last services (gas and food) heading eastbound until Exit 150, Table Rock. Exit 136 Black Butte Road This east-west road is between Point of Rocks (Exit 130) and Bitter Creek (Exit 142). Exit 139 Red Hill Road The Union Pacific Railroad parallels a lengthy stretch of I-80 here. Milepost 144 Bitter Creek Rest Area The Patrick Draw Oil Field is south of the rest area. Exit 150 Sweetwater County Route 55 Table Rock Road A company town located at this interchange was distinctive due to a large smokestack rising from the center of the housing development. This smokestack is long gone. Gas and limited food are available at this interchange. Exit 154 BLM Road BLM stands for the Bureau of Land Management, which owns a significant portion of the land not already owned by the U.S. National Park System or by the U.S. Forest Service in the state of Wyoming. An older statistic indicated that the federal government owned as much as 70% of the land in Wyoming — much of that land is the unarable land in the western two-thirds of the state. Ranching outfits typically lease the land from the government for the purposes of grazing livestock. The sometimes conflicting interests between ranchers and the federal governement has ignited what is known as the “Sagebrush Rebellion.” It began in Nevada, and the rebellion eventually spread throughout the West. Many of the rugged individualists who populate this land disapprove of Washington’s interference. This evolved as more land disputes arose, especially those tied to resource development (not just minerals, but also wind turbines and power lines). Exit 168 Frewen Road Along this portion of I-80, many of the exits lead to old stops along the railroad, including the site of Frewen. Exit 173 Sweetwater County Route 23 Wamsutter The mileage signs between Rock Springs and Rawlins use Wamsutter as a destination. Exit 184 Future Rest Area Continental Divide Road; Creston Between Exits 156 and 206, I-80 traverses the Great Divide Basin. Precipitation that falls in this basin does not flow to either ocean; instead, it remains within the basin. Exit 196 Riner Road Reassurance markers posted along this stretch from 1990 to 1997, read “EAST I-80, WEST U.S. 30, NORTH WYO 789.” Of course, U.S. 30 travels east along side I-80, not counter to it. Milepost 199 Welcome to Carbon County! EAST Cedar Street; Rawlins East Interchange WESTBOUND ONLY: Yellowstone-Grand Teton National Parks via NORTH. EAST Walcott; Hanna; Medicine Bow; Saratoga; Snowy Range Scenic Byway and take a northerly route from I-80 east to Laramie via Medicine Bow. I-80 stays close to the north end of the Snowy Range along the Overland Trail corridor. WYO 130 serves Saratoga, then crosses the summit of the Snowy Range. WYO 230 leaves WYO 130 south of Saratoga, swings into Colorado, then rejoins I-80 in Laramie. Exit 255 Hanna; Elk Mountain north leads to and Hanna. leads south to Carbon County Route 402 and Elk Mountain. Exit 260 Carbon County Route 402 Elk Mountain-Medicine Bow Road Carbon County Route 402 is the only county road listed on Exit Signs from I-80. The interchange is actually with CR 3, which intersects with CR 402 just south of I-80. CR-402 parallels I-80 between Exits 260 and 272. Exit 272 NORTH Arlington The Arlington grade (just west of Exit 272) is commonly referred to as the most often-closed stretch of I-80 in the country. Exit 279 Carbon County Route 15 Cooper Cove Road; Dutton Creek Road There was an old white square secondary state highway marker for Carbon County Route 15 along Cooper Cove Road posted in the 1990s. Milepost 280 Welcome to Albany County! Milepost 282 Clement Bengough Monument and Gravesite Traveling by at 75 mph, it is difficult to see this gravesite off the side of the freeway. It is not accessible from the freeway; instead, one must use the Dutton Creek Road exit to get to it. Exit 290 Albany County Route 59 Quealy Dome Road Eastbound travelers are 22 miles out from Laramie. Exit 310 Curtis Street; Laramie North Interchange Use east to the University of Wyoming, Geological Museum, War Memorial Stadium and American Heritage Center. Exit 316 WEST Grand Avenue; Laramie East Interchange Use and west to the University of Wyoming, Geological Museum, War Memorial Stadium and American Heritage Center. Milepost 317 SPEED LIMIT 65 (EASTBOUND) Steep grade to Sherman Hill over the next six miles of I-80 east. 2000-2001 Construction through Telephone Canyon widened the freeway from four lanes to five lanes. SPEED LIMIT 65 (WESTBOUND) Eastbound I-80 starts the descent into Cheyenne, while westbound traffic heads into the narrow Telephone Canyon. Exit 335 Albany County Route 30 Buford Road A gas station is located in Buford. Exit 339 Laramie County Route 206 Remount Ranch The best radio reception in the state is located between Mileposts 323 and 345. As I-80 travels at a high elevation, Front Range radio transmitting from Colorado are received here. Exit 342 FORMER SOUTH Harriman Road This county route was transferred from the state in the 2000s, and Wyoming 218 was decommissioned as a result. Exit 345 Warren Road Alignments of Historic U.S. 30 can be seen from around this exit. Exit 348 EAST Otto Road WYO 225 is Historic U.S. 30 between Exits 348 and 359. Exit 359 North to Casper and south to Denver Use south to the State of Wyoming Information Center and Rest Area. This is a full cloverleaf interchange. Central Avenue; Greeley Highway; Downtown Cheyenne The link from I-80 to I-180 north is a diamond interchange since Interstate 180 is not a freeway. Milepost 371 Port of Entry and Weigh/Check Station. Exit 377 SOUTH Hillsdale Between Archer and Pine Bluffs via Durham, Burns, and Egbert (Exits 370 through 391), Historic U.S. 30 more closely follows the Union Pacific Railroad via several county roads (Durham Road, Burns Road and Pine Bluffs Road). 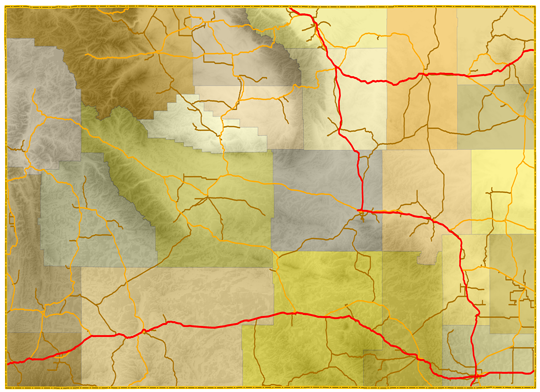 This routing is commonly called the “Old Highway” in Southeastern Wyoming. SOUTH Burns and Carpenter As of 2012, Wyoming 213 was rerouted out of Burns and extended along a new alignment north to connect to U.S. 85. EAST Pine Bluffs East Interchange Nebraska does not sign its portion of Business Loop I-80 around Pine Bluffs from the I-80 mainline. U.S. 30 is now free of I-80 for the remainder of its trip eastward. Heading west, U.S. 30 overlays the I-80 corridor for the majority of its route through Wyoming. Barker Road County routes are seldom signed off Interstate highways in Wyoming. An exception is the County Road 402 exit off I-80 near Elk Mountain. Acme Road For Historic , use between Montana State Line and Exit 14. Exit 16 Sheridan County Route 110 Monarch Road TO For , use County Route 110 to between exits 14 and 20. TO Sheridan Main Street; Port of Entry Locals like to claim that the best year-round weather in the state is in Sheridan County. Coffeen Avenue to Sheridan and Ucross Sheridan County Regional Airport via and . returns to at Exit 128. Milepost 42 WELCOME TO JOHNSON COUNTY! SOUTH for between Exits 44 and 56A. South of Buffalo, HISTORIC continues as . Exit 56A Buffalo; Johnson County Regional Airport provides the business conection into Buffalo. north of Buffalo is signed as “To and To ” heading north/westbound, but it is signed as heading south/eastbound. Exit 56B Use Interstate 25 south to Casper, Cheyenne, Fort Collins, Denver, Colorado Springs, Pueblo, Trinidad, Santa Fe, Albuquerque, Las Cruces This is one of three Interstate-to-Interstate connections in the state of Wyoming. The directional-T interchange here is the only multi-level junction in the entire state. U.S. 87 leaves I-90 and begins its southeastern trek toward Texas via Southeastern Wyoming, Colorado and New Mexico. Exit 58 Buffalo and Ucross U.S. 16 provides a slower-paced, less-traveled alternative to I-90. To Cloud Peak Skyway via west, use Exit 58. Milepost 96 WELCOME TO CAMPBELL COUNTY! Exit 102 TO Campbell County Route 19 TO Buffalo Cut Across Road (Campbell County Route 18) Buffalo Cut Across Road in Campbell County is the same as TW Road in Johnson County. The county route numbers also change. TO Gillette; Ucross; Weston Welcome to Gillette, the Energy Capital of the United States. Eastbound travelers are about to enter the Black Hills region of Northeastern Wyoming. Westbound travelers are in the Powder River Basin. Gillette Use for via Rozet between Exits 128 and 153. Milepost 149 WELCOME TO CROOK COUNTY! Exit 154 Moorcroft; Pine Haven Gas, food, and lodging are available in Moorcroft. Exit 191 Crook County Route 207 Moskee Road Historic U.S. 14 closely parallels I-90 between Exit 189 and the South Dakota state line along a frontage road on the north side of the freeway. This is an unmarked state-maintained roadway. Exit 199 North Aladdin; State of Wyoming Information Center and Rest Area Use Wyoming 111 north to Wyoming 24. The welcome center at this interchange opened in 2010 and is well worth the visit. Exit 205 Crook County Route 142 Beulah Redwater Road; Lower Creek Road This is the final interchange in Wyoming. After Beulah, motorists enter South Dakota, heading through the rest of the Black Hills toward the Great Plains. WEST Laramie The junction with I-80 is simply a diamond interchange with stoplights at the base. Exit 0C Fifth Street (Campstool Road) This “exit” is the third stoplight heading northbound. Between the signals at Fifth and Ninth Street is a pedestrian over crossing. WEST: Laramie Interstate 180 ends at the fifth stoplight. Reassurance signs north of Lincolnway along Central Avenue only indicate Business Loop I-25, U.S. 85 and Business U.S. 87.